Welcome to Club EDICT. By joining, it’s the best way to ensure that you are always up-to-date on new wine releases, have priority access to any limited runs, are notified first of any upcoming events and important news, and have access to club-only events. There are three levels of membership to choose from. Note: the following levels show our current releases. Selections subject to change. A special fourth shipment for the Holiday Season consists of two (2) bottles Single Vineyard Selection in a beautiful wood box. Federal law requires that someone 21+ be physically present to sign for wine package at time of delivery. We highly recommend shipping to business addresses. Shipments to Alaska and Hawaii incur an additional $30 shipping charge. You must be 21 or over to purchase wine. Charges will be billed directly to your credit card prior to each shipment. Please notify Edict of any address, e-mail, telephone, and/or credit card changes at the time of the changes. We cannot make any changes to your account once a Club Edict shipment is in process. Membership may be canceled at any time prior to a shipment being in process. 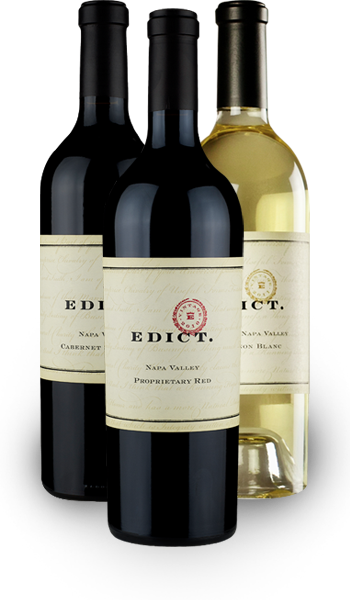 Due to the limited availability of the wines, membership in Club Edict is also limited. Once enrollment has closed, a waiting list will be maintained for those wishing to join. There is no membership fee to join; simply the cost of each shipment plus applicable sales tax and shipping cost. If a shipment is returned to Edict for any reason other than the fault of the common carrier, shipping charges will be applied to the re-shipment. At the current time, we can only ship wine to certain states due to state licensing regulations. More states are being added all the time.